Want to become the 1 most successful guitar teacher in your area and earn a 6-figure income in the process from teaching guitar? Here’s what you need to achieve it. First you need to learn the strategies, tactics and knowledge that it takes both in terms of becoming an elite guitar teacher and also in terms of attracting (and keeping) new students like a magnet. Next, you need a better guitar teaching model. I promise you that the teaching model you are using now (and others you may have heard about) is inferior. Not only will I prove it to you, I’ll give you several other models that are better for your students and a better for you to earn more money. Third, you need support - lots of support. It’s not enough to simply learn what to do, you need to have somebody hold your hand through the process of actually getting it done. I will help you do that by speaking with you one-on-one on the telephone to make sure you know exactly how to do things and then I’ll hold you accountable so that you really do them! 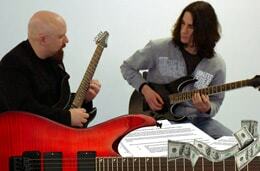 With this coaching, you will have no excuse for not becoming the top guitar teacher in your area. The "How to teach guitar" guide for guitar teachers. Discover the proven methods in this guide on how to teach guitar that destroys the conventional approach to helping guitar students become great guitar players. You'll also learn what to do if you don’t know what to teach someone, how to teach students at varying skill levels, and how to approach very difficult-to-teach topics such as scales and modes, improvising and reading music. In addition, I will tell you about all the mistakes that guitar teachers constantly make when teaching guitar and why their students make slow progress as a result... Most importantly, you will learn how to avoid these mistakes in ‘your’ teaching, help your students progress faster, get them to remain your students for years (and love every minute of it! ), grow your reputation as the dominating guitar teacher in your area, and as a result - earn more money teaching guitar. Learn how to attract guitar students like crazy using highly effective strategies that are proven to work! In this eCourse I will show you: how to attract students to you who may not live near your teaching location, where to publish your guitar lesson ads to get maximum results, and how to position yourself (and your lessons) in such a way that price will not be the main factor for your prospective students. I will also teach you how to avoid the damaging mistakes guitar teachers make during their very first conversation with prospects and how to make students want to study with you vs. your competitors. Most importantly, you will learn not just one way, but ‘many’ new and proven methods to get students so that you are never dependent on just a single way to grow your business! If you are still struggling to make ends meet teaching guitar, this course will show you how simple it really is to have new students pound on your door daily and earn a great income as a guitar teacher. Beginner guitar students make up the majority of all guitar students and they can easily remain studying with you for a long time, ‘if’ you are extremely good at: getting them to believe in their potential, making their first guitar playing steps easy and rewarding, and keeping their motivation high along the way. This eCourse will show you (step-by-step) how to do all of the above by using the teaching method that has proven to work for thousands of students I have taught over the years as well as for the students of hundreds of teachers whom I train to teach guitar. You will also discover why the vast majority of guitar methods (and guitar teachers) for beginners drive most beginners to quit lessons (and guitar) and how to make sure this doesn't happen to you! I will also give you the exact materials to use with your beginning guitar students to help them progress faster, easier and more effectively than they ever could with any other guitar teacher in your area. Applying the proven strategy and materials in this eCourse will give you the tremendous satisfaction of helping huge numbers of people learn to play guitar well while growing your reputation and business at the same time! The Elite Guitar Teachers Inner Circle program is just so massive. Everything that’s in it is just massive…ideas that I never in a thousand years would have thought of and I don’t know that I ever would have heard them from anyone else. …Ways to reduce the time that you are teaching, increase the amount of money that you are earning while taking care of your students in a way that positively affects their lives and their education. After working with Tom, I noticed definite improvements in all the areas. I can finally take time to work on writing my own music for the first time in 20 years while my business grew by 500% over the last year. Tom's Elite Guitar Teachers Inner Circle enabled me to make the transition from teaching guitar at a music store (and giving the store a big piece of my income) to starting my own teaching studio. The methods Tom lays out for acquiring, obtaining and retaining students work extremely well--there is no other teacher in my area doing things the way I am-- both in the way I teach and the way I acquire students. The increase in my income from teaching guitar, the convenience of teaching out of my own studio and being able to build a guitar teaching business that greatly benefits my students (and me) has been more worth the investment I made in the course. This is great stuff. The Elite Guitar Teachers Inner Circle program is so valuable because of the amazing material and teaching ideas Tom introduces. This program is truly one of a kind. It teaches you how to teach, but more importantly how to run a 6 figure guitar teaching business. If you want to have total freedom and enjoy every second of your actual day job, meet amazing people and have a blast, this program is for you.